God be He exalted says: (It is He Who shows you the lightning, as a fear (for travelers) and as a hope (for those who wait for rain). And it is He Who brings up (or originates) the clouds, heavy (with water), and Ar-Ra'd (thunder) glorifies and praises Him, and so do the angels because of His Awe. He sends the thunderbolts, and therewith He strikes whom He wills, yet they (disbelievers) dispute about Allah. And He is Mighty in strength and Severe in punishment.) [Surat Ar-Ra'd, verses: 12, 13]. And He be exalted says: (And among His Signs is that He shows you the lightning, for fear and for hope, and He sends down water (rain) from the sky, and therewith revives the earth after its death. Verily, in that are indeed signs for a people who understand.) [Surat Ar-Rum, verse: 24]. God be He exalted talks in these verses about the phenomenon of lightning, the lightning is a double edged weapon, it is a good sign and hope for raining and at the same time it might be destroying for properties and killing for souls. As for the lightning, the commentators say that it is always frightening and destroying as it happens suddenly and it directly hits anything in its way. Scientists have studied the lightning for a long time and they found that the clouds are always electrically charged, it is negatively charged at its base and positively charged at its top. As for the earth, it is mostly positively charged. When the beam of lightning starts to release from the base of the cloud which is negatively charged towards the earth which is positively charged, the opposite charges meet and collision occurs and the lightning beam rushes with a speed of more than one hundred thousand kilometers per second. 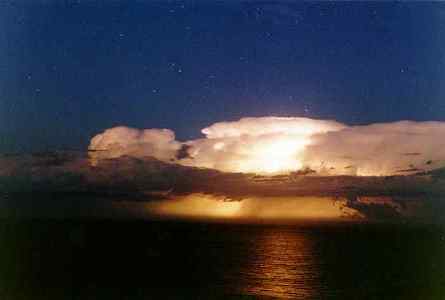 The lightning doesn't occur unless in the case of heavy cumulous clouds, that's why God be He exalted said: (And it is He Who brings up (or originates) the clouds, heavy (with water)) so there is a relation between heavy clouds and lightning. We notice from these verses that the holy Quran mentioned the lightning and related the occurrence of this phenomenon to heavy rain (among His Signs is that He shows you the lightning, for fear and for hope, and He sends down water (rain) from the sky, and therewith revives the earth after its death) and related also between the lightning and the high heavy clouds: (It is He Who shows you the lightning, as a fear (for travelers) and as a hope (for those who wait for rain). And it is He Who brings up (or originates) the clouds, heavy (with water)) and this is what was recently proved by scientists.